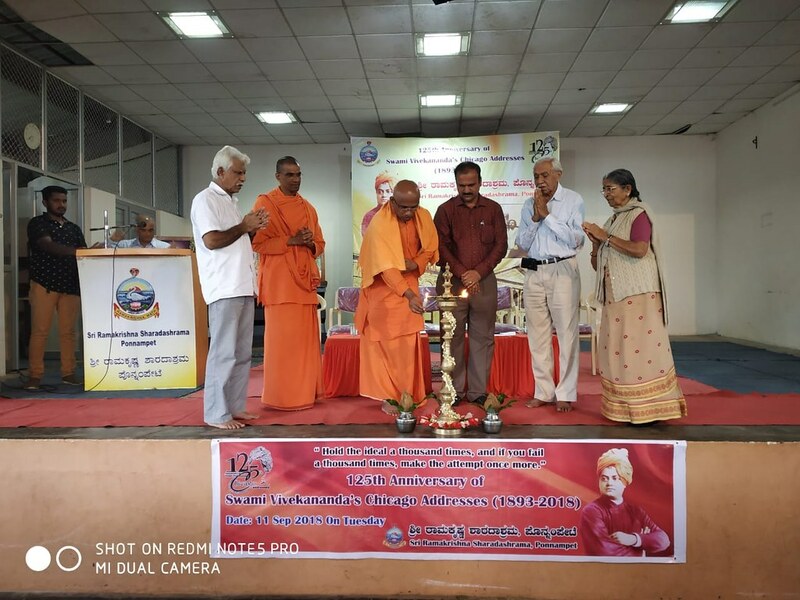 To commemorate the 125th Anniversary of Swami Vivekananda’s Chicago Addresses, Ramakrishna Sharadashrama, Ponnampet has started a series of programmes. On 26 July 2018 5 pm, at Kushal Nagar, Kodagu, a sastanga was organized and about 100 people were present. On 27 July 2018 5 pm, at Madikeri, Kodagu, a satsanga was organized and about 50 people were present. On 28 July 2018 5 pm, at Virajpet, Kodagu, a satsanga was organized and about 100 people were present. All the three days, Revered Swami Muktidananda gave talks in the presence of many dignitaries. On 11 September 2018, the Ashrama organised a procession and a program for the youth. The procession started at about 2 PM from Basaveshwar Temple to the Ashram. Later, a youth convention was conducted in which various lecture sessions to introduce Swami Vivekananda’s Chicago speeches were held at the Ashrama. Mr. K Harish, Chairman of Vagdevi Vilas Institutions, Bangalore was the chief guest of the program. Shri K P Uthappa(Founder and Former Chairman of Kodagu Bharatiya Bhavan) and Kumari Hottengada Sundari addressed the students. These honorable speakers explained the impact of the Swami Vivekananda’s speech at the Parliament of religions, Chicago on India and Hinduism. Swami Vivekananda’s speech at Chicago was read in the program. 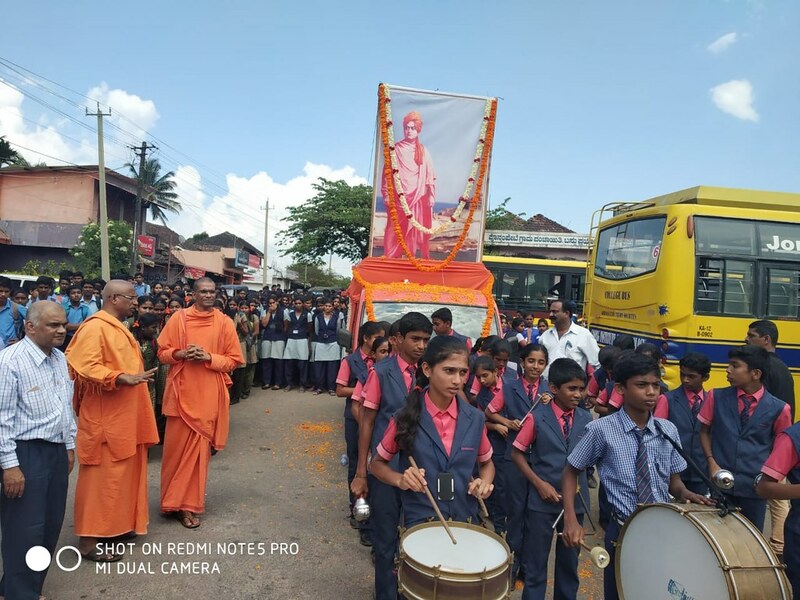 Swami Bodhaswarupananda, Adhyaksha of the Ashram said that Swami Vivekananda’s lecture is the only one instance that a centenary was celebrated in the history of the world and now 125th anniversary is being held. He also added that there is such a power in the lecture of Swami Vivekananda. At 3.30 pm Conch Shells were blown. 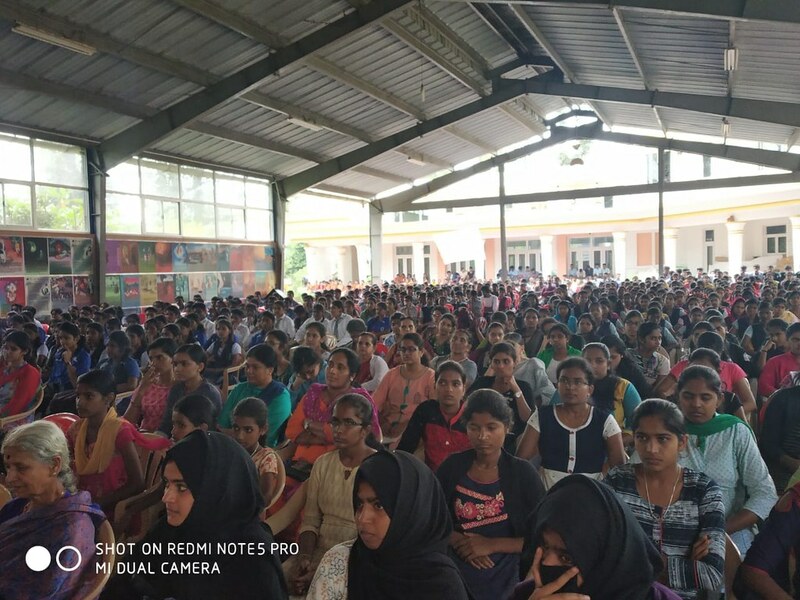 More than 700 students participated in the program from various institutions like Cauvery Degree College(Gonikoppal), Coorg Institute of Dental Sciences(Virajpet), Coorg Institute of Technology(Ponnampet), College of Forestry(Ponnampet), Govt. Pre-University College(Ponnampet) Sai Shankar Institutions(Ponnampet)Appachukavi School (Ponnampet) Sudevi PU College (Ponnampet), Lions School(Gonikoppal), Coorg Public School(Gonikoppal) etc.